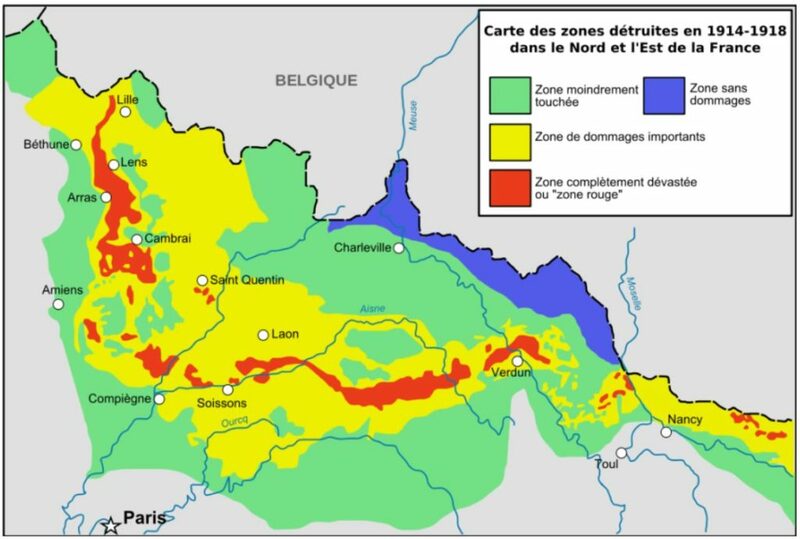 Some 100 square kilometers of France is completely closed to people. It is known as Zone Rouge – the Red Zone. The land there is utterly poisoned by the human folly that was World War I. To this day it remains unfit and unsafe to tread upon, 100 years later. Surrounded by many more kilometers that have been slowly and imperfectly reclaimed, most people are unaware this caged landscape exists among the otherwise beautiful French countryside, near the border with Belgium. There the Red Baron fought and fell, along with countless others of less-lofty reputations. And there, two place names became synonymous with human suffering on an obscene scale, because of the atrocious loss of life that took place there – Verdun and the River Somme. As revealed in eye-opening detail at a blog dedicated to all sort of curiosities, the Zone Rouge is freakishly other-wordily, as the residents living near by continue to harvest a ghastly collection of munitions and human remains. The essay is supplemented with many photos from one Olivier Saint Hilaire, which are indeed evocative. With more found via the link to his personal website. 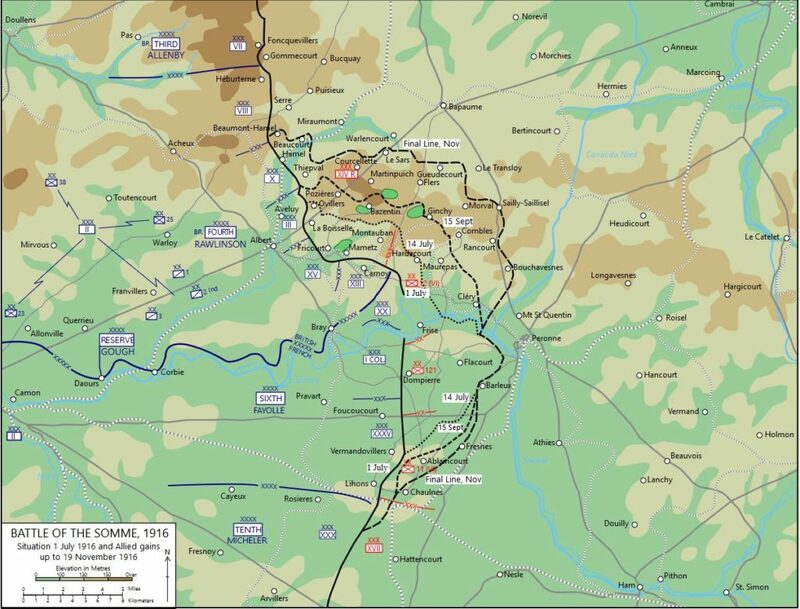 This representational map of the Somme campaign makes up the Red Zone area between the towns of Cambrai, Arras, and Amiens. One hundred years ago, one of the most cataclysmic battles in human history was raging in northern France. The Battle of the Somme began on July 1, 1916. Fifty-three years earlier, on July 1, 1863, the battle of Gettysburg commenced in Pennsylvania. Over three days of fighting at Gettysburg, a total of 51,112 Americans on both sides were lost as casualties during the entire battle, with some 7,000 killed outright. It remains the bloodiest, most lethal three days in American history. During the first day’s fighting at the River Somme, the British Army alone lost over 57,000 men, with 20,000 dying on the field. The battle lasted four months. The combined losses of the Franco-British and Imperial German armies were over 1.5 million men. ONE AND A HALF MILLION MEN. On Thursday last, I watched the semifinal football match of the European championships, between France and Germany. These young men, almost all of them in their 20s and among the finest physical specimens their nations could produce, were giving everything they could to prove victorious for the expectant countries and their own personal glory. And throughout the relatively civil competition, I was haunted by the fact that these same champion athletes would almost certainly have been wearing the uniform of opposing armies locked in deadly strife, had they been born 100 years earlier. They would have undergone a very different kind of training and physical conditioning to hone their elite skills for the purpose of killing their fellow Europeans, in a war between states whose rulers were, in some cases, cousins. 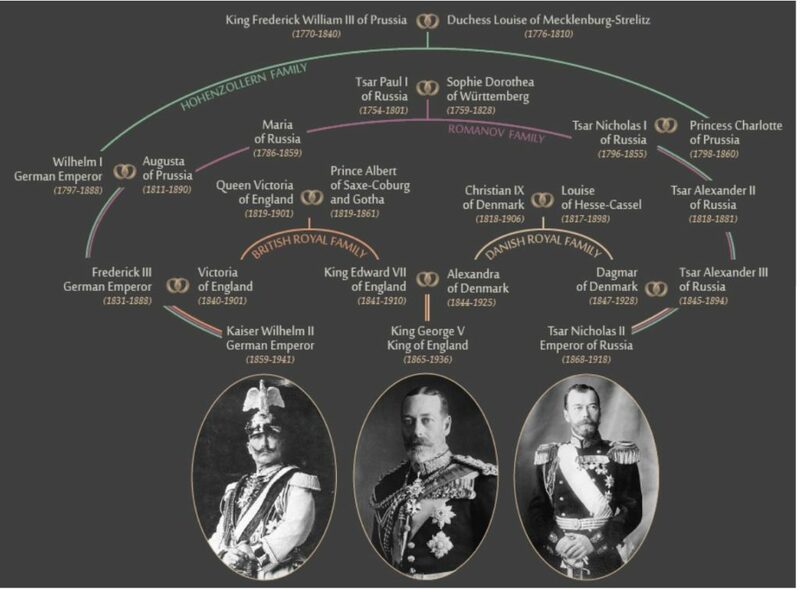 For me, the obscene absurdity of the so-called Great War isn’t found in the fact closely-related cousins could inflict such horrors upon their own closely-related European peoples. But rather, that the people of Europe could have done it all over again less than 30 years later – with far worse destruction of treasure and human lives. As the United Kingdom prepares to leave the European Union, it is important to remember that the peace that has existed there is not to be taken for granted. Rather, it has required an enormous change of attitudes in nationalism, jingoism, and xenophobia, and continual efforts since the end the Second World War to prevent backsliding. May the centennial of the Somme and other atrocious acts of war in the coming months and years help to educate and supplicate the current tensions rippling across Europe and its neighbors.